I loved the episodes of Bewitched when one of Aunt Clara’s spells went awry and an historic figure like Benjamin Franklin or George Washington materialized in the middle of Samantha’s living room or Darin’s office. I thought it was hysterical to watch how confused they were by all of the modern conveniences like telephones, cars, and indoor plumbing. I have to wonder what William Penn might think if he had been transported from the past into the backseat of my Volvo the other day as my son and I made the trip back to Yardley from the Newark airport. Our topics of conversation included impressions of a full body scan vs. traditional security, whether it was everyone or just us that got a pat down in addition to the body scan, and the limitations of the GPS in an area that has right turns that appear to be exits and a bazillion roads converging in a compact geographic area. “I’m going to text Dan and let him know that we’re stuck in traffic on the Turnpike,” Christian said. “It would be even faster if we had an EZPass and didn’t have to go through one of the cash only lanes,” he said. William might have been even more confused if he had watched me find the website for the Pennsylvania Turnpike on my iPad, send the link to one of my three email addresses, and bookmark the site to my favorites. I felt a little like William when I drove to Acme today to purchase my EZPass. I wasn’t quite convinced I wouldn’t make a fool of myself at the Customer Service desk, after all, a Transponder sounds like something you would purchase at a science fiction memorabilia shop or a comic book convention, not at a grocery store. The brochures on the counter reassured me that I was in the right place. I paid for my pass, listened carefully to the instructions to register my gadget within 72 hours, and hoped I’d be able to figure out how to mount it properly in my car. My heart pounded just a little as I passed through the toll booth at five miles per hour on the return leg of my test drive to Hamilton and back. There were no tickets, no one ran after me, and I think the light that flashed as I drove through meant everything was good to go. Oh, I love this – you are so hilarious but this is also a very informative post – hehe! thanks! it only took me 4 years to get up the nerve to figure it out- hehe! Making the mundane funny, good work. 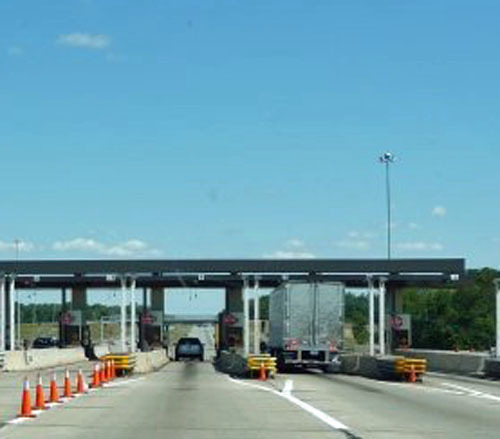 Urban myth or legend has it that if you travel through the toll gate way over the crawling speed limit posted, the Turnpike Authority will send you an automatic speeding ticket in the mail. Ahh, to speed or not to speed? Maybe fodder for your next post?